These rare images of Evacuation Site II and other camps on the Thai-Cambodian border were taken in 1985 and 1986. Coming to light more than 30 years later, these photographs offer an intimate glimpse of people rebuilding their lives and culture in refugee camps after the tragic losses of the war. Only about 10 percent of Cambodia’s artists—dancers, musicians, writers—survived the Khmer Rouge regime. The few surviving masters in the border camps sought to pass on a vanishing repertoire, in some cases breaking tradition in order to carry on tradition—for example, by teaching girls to play musical instruments. These images reveal the resilience and resourcefulness of the Cambodian people. Here are individuals at work, at play, making music, learning to dance, and finding ways to survive and revive the arts after unspeakable sorrow. A collection of these photographs is on permanent exhibit at the Cambodia Peace Gallery in Battambang, Cambodia. The selection of images in this book is taken from a larger forthcoming volume. Sharon May went to photograph Cambodian refugee camps on the Thai-Cambodian border for three weeks in 1985 and ended up staying for nearly two years. She taught music and worked as a researcher and photographer for Columbia University’s Center for the Study of Human Rights. She co-edited the book In the Shadow of Angkor: Contemporary Writing from Cambodia. Her stories and photographs have appeared in the Bangkok Post, Kyoto Journal, Chicago Tribune, Best New American Voices, Mānoa, and other international publications. She is a former Wallace Stegner Fellow at Stanford University. A collection of these images is on permanent exhibit at the Cambodia Peace Gallery in Battambang. 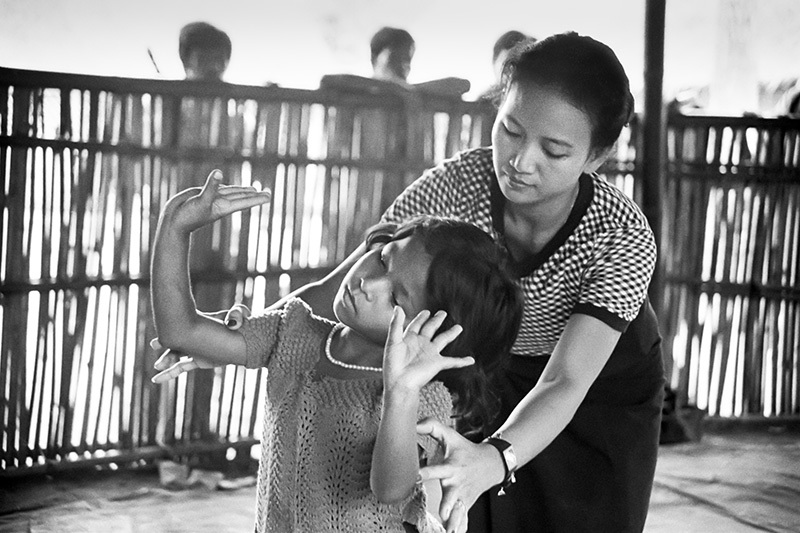 These photographs are from the book Dancing in Site II: Life and Art in Cambodian Refugee Camps after the War.